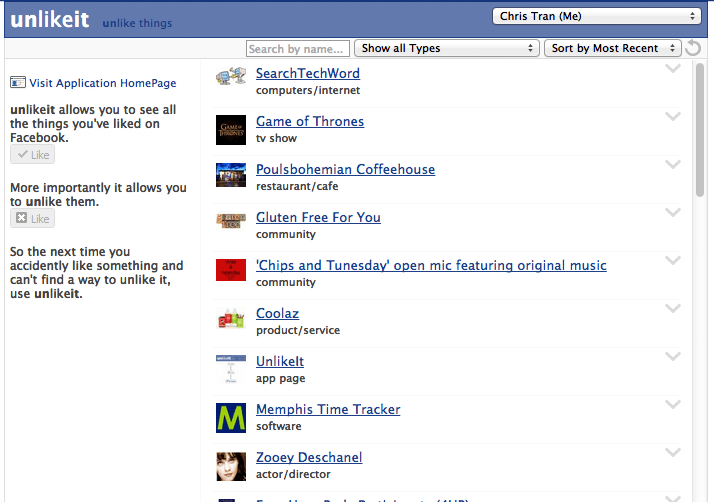 A Facebook Unlike Application to help you search and sort your likes. Quickly Unlike in 2 easy steps. So you clicked on your friends video link only to find that it hijacked your like. Now it has access to you news feed etc. You head to Facebook -> Account -> etc and try to find you way to your like list (now sure where it is off the top of my head). The link directs you straight back to the scammerâs site, thus registering you like them again. Itâ’s a viscious circle where no obvious mechanism to unlike is available. Some scams floating around at this time are: Harmless prank ends in tragedy, or Dad walks in on daughter etc. This is why I’ve created: https://www.facebook.com/unlikeitapp. It shows you stuff you’ve like and allows you too unlike them. You can also sort alphabetically or most to least recent. As a bonus you can also use the app us a ‘Page’ or one of your other identities.